In small bowl, beat cream cheese and feta cheese with electric mixer on medium speed until smooth. Stir in cucumber. Place tortillas on microwavable plate or microwavable paper towel; microwave uncovered on High 10 to 15 seconds to soften. Spread about 1/4 cup cheese mixture over each tortilla. Top evenly with olives and tomatoes. Arrange 1/2 cup spinach on each tortilla to within 1/2 inch of edge. Roll up tightly; wrap in plastic wrap. Refrigerate 2 to 3 hours to blend flavors. Trim ends of rolled tortillas if desired. Cut each roll into eight 1-inch slices. Arrange with cut sides down on serving dish. 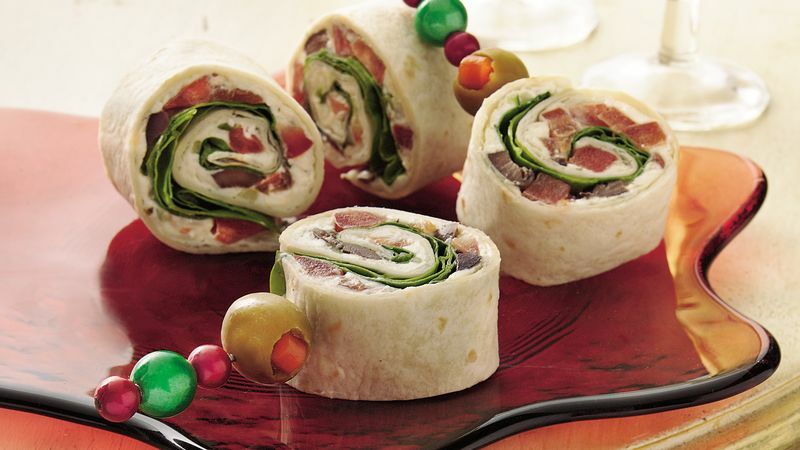 Make pinwheels up to a day ahead of time and refrigerate.